On the early Earth, light came not only from the sun but also from the incessant bombardment of fireball meteorites continually striking the planet. Now, the recent work of University of South Florida (USF) associate professor of geology Matthew Pasek, USF researcher Maheen Gull, and colleagues at Georgia Institute of Technology, has demonstrated that these meteorites may have carried within them an extraterrestrial mineral that, as it corroded in water on Earth, could have provided the essential chemical spark leading to the birth of biological life on the planet. 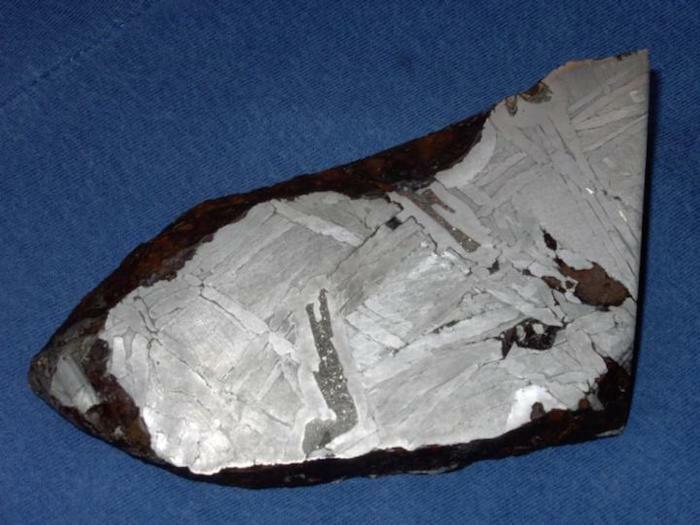 In previous work, Pasek and colleagues suggested that the ancient meteorites contained the iron-nickel phosphide mineral "schreibersite," and that when schreibersite came into contact with Earth's watery environment a phosphate, a salt, was released that scientists believe could have played a role in the development of "prebiotic" molecules. In a recent study appearing in Nature Publishing Group's Scientific Reports, the researchers focused on the properties of schreibersite and conducted experiments with the mineral to better understand how - in a chemical reaction with the corrosive effects of water called "phosphorylation" - schreibersite could have provided the phosphate important to the emergence of early biological life. "Up to ten percent of the Earth's crustal phosphate may have originated from schreibersite, so the mineral was abundant and readily available to engage in early chemical reactions," said Pasek. "This ready and abundant source of reactive phosphorous may have been an important part of the prebiotic Earth and possibly the planet Mars," said Pasek. What needed to be determined, however, was just how schreibersite reacted chemically with the early Earth's watery environment and what resulted from the chemical reaction. To test their hypothesis, they built an early Earth model environment, an organic-rich aqueous solution in which schreibersite might react and corrode in a way similar to how events may have unfolded in prebiotic chemistry. The model they constructed provided an opportunity to observe the thermodynamics of phosphorylation reactions of a phosphorus-containing synthetic schreibersite, which they created to be structurally identical to its meteorite counterpart. "A thorough exploration of the extent of phosphorylation of nucleosides (made of a base and a five carbon sugar) by schreibersite was necessary to evaluate its potential prebiotic importance," explained Gull, a post-doctoral fellow and visiting researcher at USF. "All of our experiments indicated that a basic pH, rather than acidic pH, was required for the production of phosphorylated products. Although phosphorylation can take place using a variety of phosphate minerals in non-aqueous solution, prebiotic oxidation in water is more likely given the dominance of water across the solar system." The prebiotic reaction they duplicated in the laboratory may have been similar to the reactions that ultimately led to the emergence of metabolic molecules, such as adenosine triphosphate (ATP), which is called the 'molecule of life' because it is central to energy metabolism in all life. Pasek and Gull also explained that even life today builds from activated nucleotides and that phosphates are still an important part of metabolic processes in biological life, so it is likely that a phosphorylated biomolecule played an important part in creating the prebiotic chemical context from which biological life emerged. Prior work on nucleoside phosphorylation has shown that inorganic phosphate can serve as both a catalyst and a reactant in nucleoside synthesis, they said. "The reactions we observed in our experiments have shown that the necessary prebiotic molecules were likely present on the early Earth and that the Earth was predisposed to phosphorylated biomolecules," the researchers concluded. "Our results suggest a potential role for meteoritic phosphorus in the development and origin of early life." The researchers also concluded that the mechanism of phosphorylation was still unknown and actively being investigated. "It is possible that the process occurs in solution or on the surface of the schreibersite," they explained.